Today was a town day! It’s funny because technically, almost everyday thus far has been a town day, but we needed some R&R in a real place. 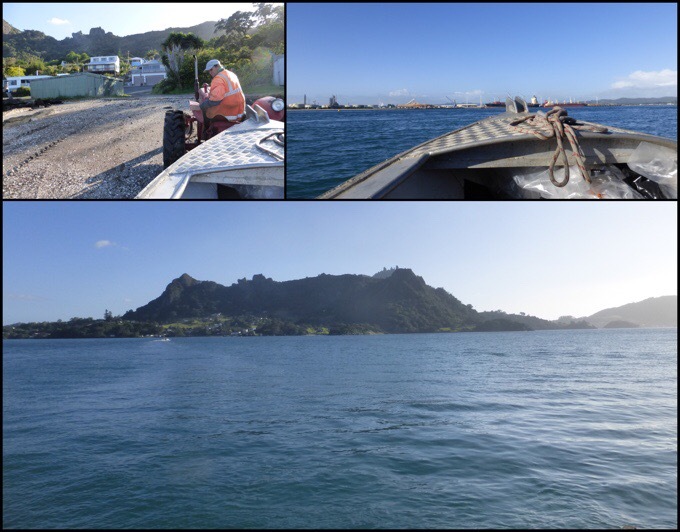 We had our focus set on making it to Waipu as quickly as we could to just relax. Though, there was still what many would consider a full day of hiking ahead of us. We first needed to hike a bit more along the shoreline to where we could get a boat across to Marsden Point. There are a few options for hiring somone to take you across, but there are also many who go to work on their own personal boat in the morning. The three of us decided to try the option of gettting a local on their way to work first. We set off at 6:50am for a nice morning walk along the road and then along a coastal walkway. We could see the oil refinery across the bay where we would need to be dropped off. 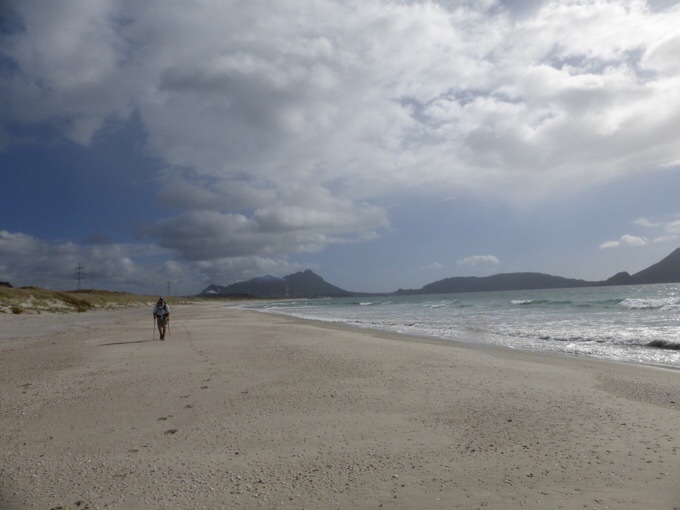 When we got to Reotahi Bay, we knew that was our best shot at finding someone. It was dead quiet and there wasn’t any traffic at all. We walked slower hoping a car with a boat on a trailer might come by. We could see some parked there that must have gone across much earlier. As we were walking just before 8am, a man in a robe yelled down to us from a balcony. It turns out that he was the man (along with his neighbor) that does the $10 shuttles across, Peter and Duncan. I had called them yesterday, and they had told me they didn’t think they could do early morning. Well, with us right there, I think they had trouble passing up the chance to make a quick $30. In about 15mins, we found ourselves on the other side of the bay. It was the best possible timing we could have asked for! With the numbers on this trail growing, it will be interesting to see how all these boat shuttles end up going. That is our third one in about a week. It’s an added challenge to figure out the logistics of that, along with who to call to arrange accommodations each night. There are a lot of phone calls, messages, follow-up calls, and variables with all of this. Along with that, comes the technical aspects of people having phone plans that don’t get service or have limited calling. Also, there is the battery used up to look all of these things up each day and call them all to compare prices and options. Good news is that there is usually a nice long paved roadwalk to multi-task and get this stuff figured out each day. It tends to be a last minute thing because no one is really sure how far they’ll make it each day with many terrain variables, possible town stops, tides, and weather to contend with. I’m used to doing this once every 4-7 days on a thru-hike, but it’s almost a daily thing on the North Island. Not a fun thing for me and I find it more taxing than fun to deal with all the planning and logistics. 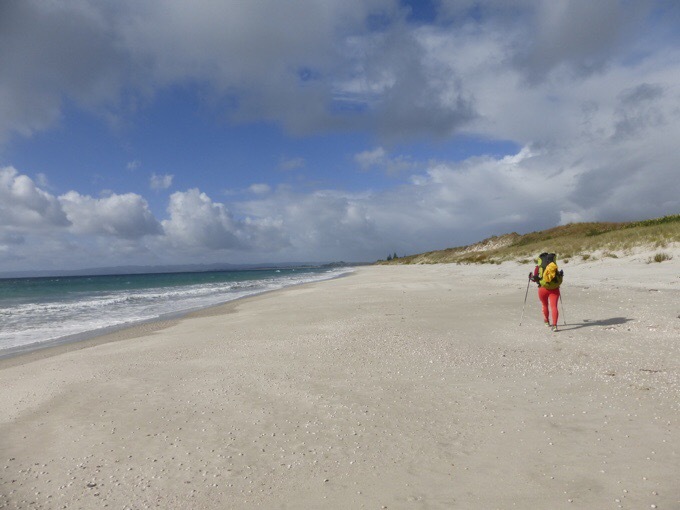 Once we were over at Marsden Point, we basically had 6mi/10km of beach walking before cutting inland toward Waipu. 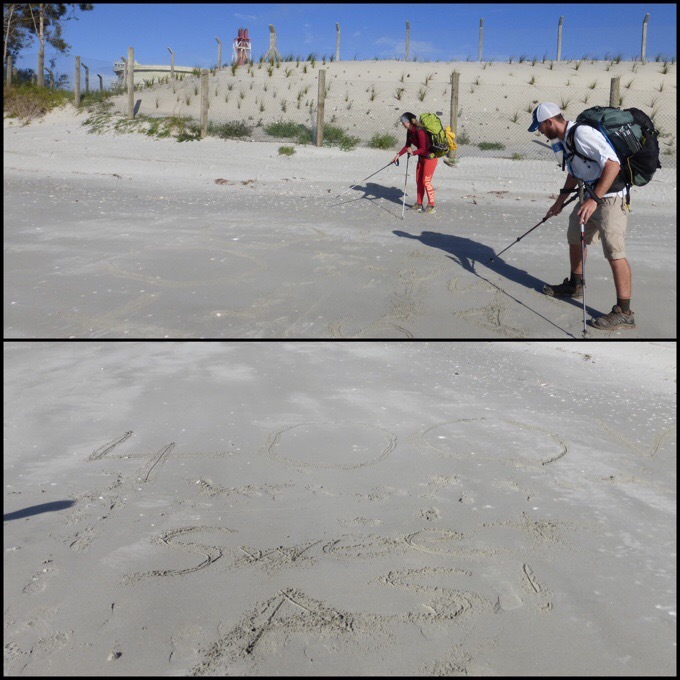 Becky has been excited about hitting the major kilometer markers, so when we passed the 400km(250mi) mark, which is a first and a big deal for her to have walked that far, she and Will wrote it in the sand. Made it to 400km! Sweet As! The problem was that due to high tide, we couldn’t cross a river mouth halfway down the beach walk. 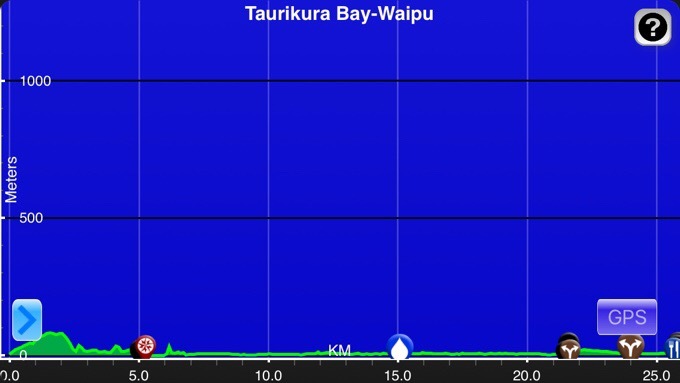 After 2mi/4km, we had to cut inland to be able to cross the river over a bridge in the town of Ruakaka. Long story short, there aren’t directions for this, so we cut over where it looked like there was a road and ended up finding our way into an unsecured part of a secured area that is somekind of water and fish plant or facility. We found someone to lead us through and eventually got into town…where there was a small supermarket (4 Square is what they are called here) and a bakery we couldn’t resist! Our hunger has been through the roof and our self control with all these stops is basically nil. We have given in and are basically buying anything we want at this point. I’m pretty good at resisting things on most trails, but here it’s kinda part of the trail, so it’s like torture to walk by a real breakfast or burger with hiker hunger and still eat your trail bar. Oh well, I am thinking I’m just making up for lost time and all those times I controlled myself on other trails. The 4 Square had Oreos!!! I stocked up and Will finally got flip flops. With all the water and mud we’ve been going through, he’s been quite envious of our sandals/flip flops, and he was stoked to get a good price on a pair. We continued on through town for another hour or more and the rain came down the hardest it has all trail for any of us. It still only lasted maybe 15mins at a time and we were able to dry off quickly. The wind was full force in front of us, so I had the umbrella as a shield and was very happy to have it. 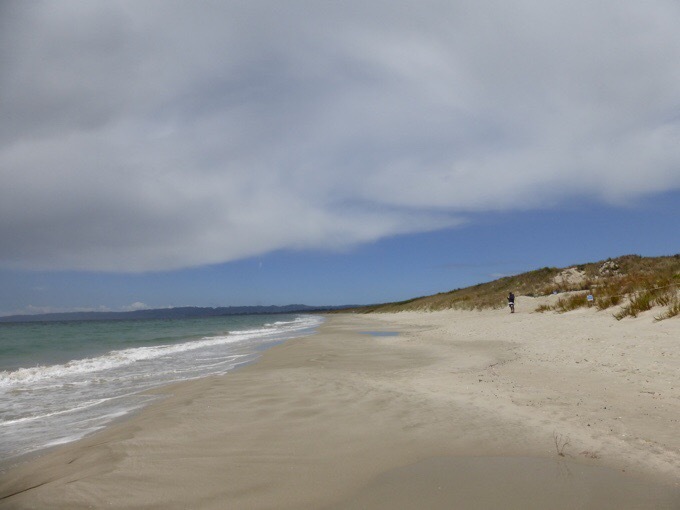 We eventually wound back over to the beach and finished up 2mi/4km of beach walking before cutting in towards Waipu. 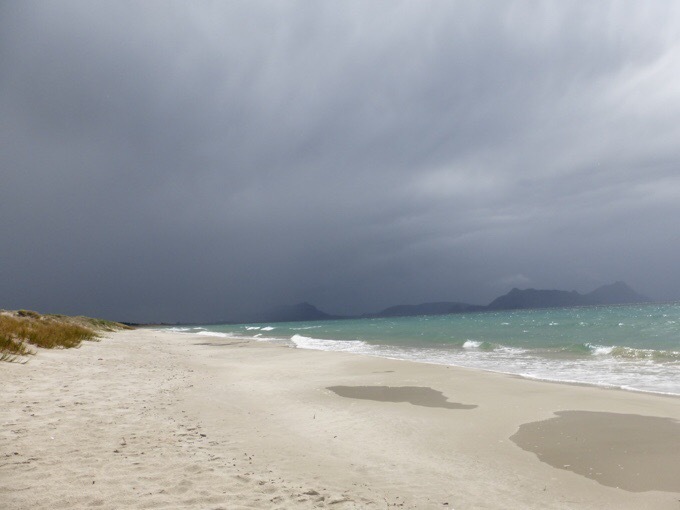 When we got on the beach, we could see the rain back behind us that had just come through and then the welcomed blue skies we were headed to. 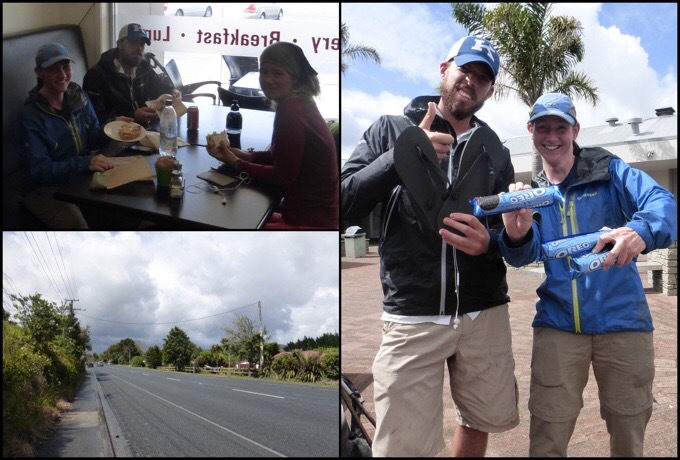 There were a couple miles of highway walking into Waipu and we were ready to crash. It was not a big mile day for me, but just like every other day, I’ve been completely willing to stop early when given the chance. Waipu! We get to rest! We are staying at the Waipu Wanderers BBH Backpackers. I reserved it last night and we are so glad we did! It’s in a good location and is the best accommodations so far. We got lucky and got quite a deal I can’t publicize. We are in a house-type place that has three bedrooms. One for us three, one for Sally and Calvin (who camped with us last night). It has a living room, kitchen, pretty good wi-fi, showers, washer/dryer, electricity, and towels all included! I think it’s usually more, but Elaine, the woman in charge is running it on her own while her husband is out of town and she said she couldn’t be bothered to deal with the extras. Works for us! We ate at the Pizza Barn, which is world famous for its pizza and it was quite fulfilling. Then we did our resupply and bought some stir fry to make for dinner tonight. By the time we finished errands, showered, and got laundry going, it was already after 6pm. I had tons of emails and blog things to catch up on. Elaine let me come in her house and use her computer for a couple hours. It really saved me a ton of time! Thanks to Elaine! While I was there, she showed me her hobby of making amazing cakes and icing designs. They were pretty incredible. 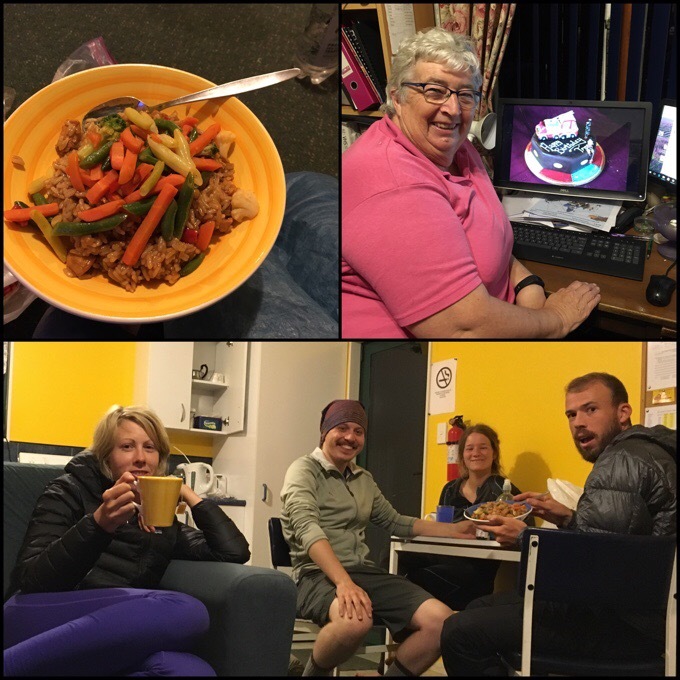 Afterward, I returned to the hostel house and had stir fry that we got at the store. Another great choice by the three of us to cook in. Elaine with a self designed cake, Sally, Calvin, Becky, and Will. The next leg is full of more towns and little food stops, so we didn’t need to buy much. Felix is a day behind and may catch up in a couple days as we aren’t really pushing anything big. If I were hiking solo, I do think I’d be doing longer days and more miles, but I’m enjoying this and am in not time crunch to push any harder right now. I’m still right on schedule to finish when I’d like in early March (so I could maybe make it to Tasmania), so it’s working out. Here are some brief bios on both Becky and Will now that we may be doing many more days together. I met Becky on Day 6 coming out of the terribly muddy and challenging Ratea Forest. Since then, it’s been great to be around such a new and young (20yrs old) hiker. I always like being around a first time thru-hiker because I get to relive those firsts through them. She has a great sense of humor and our personalities click. It’s been fun to see her develop her trail legs out here. Though she doesn’t believe it to be true, she has the capacity to really take off on these trails and leave us all behind. Especially when her heavy metal music is playing, she’s unstoppable! As I mentioned awhile back, Becky was not always in this physical shape and it wasn’t but just 5yrs ago that even going up stairs was a challenge due to being quite overweight. She has a lot of grit and it’s been fun to see her learn her technique and push herself. The main age difference I’m noticing in our almost two decades apart is her ability to dive deep into Instagram when I just get frustrated by it! Becky and Will are both here on 12 month work visas, and will be seeking work here in NZ after the hike. It’s something NZ does for people under 31yrs old to encourage new younger citizens from other countries. Neither of them are too particular about anything except making sure they have plenty of soda to feed their addicitons, ha! As for Will, I met him on Day 7 at camp that night. Will is not new to thru-hiking. He did half the PCT in 2013 (had to go home unexpectedly for something out of his control) and has a good handle on his gear and routines. Will is 26yrs old and recently finished grad school with an English teaching degree (and all subjects that fall under that umbrella) up through high school. He is trying to decide if he would like to go on in schooling to be a professor because he really enjoys the higher level literature and having adult conversations about them…which I fail terribly at! Will was born and raised in Kentucky and loves the Wildcats. It’s already been said that if they make it to the NCAA finals, he will be flying home to watch them play. Will has been an athlete his whole life. He started tennis at the age of 2yrs old and played all the way through college. He’s been doing some coaching as well with both high school and college level teams. Due to all those years on a tennis court, Will has hip and joint pain that can make some of these steep ups and downs (and roadwalks) unenjoyable, but he toughs it out without complaint. His headphone entertainment of choice is a sports podcast. I think one of the best things that could happen to him in a NZ town would be if there was an Arby’s, which he badly misses. Other than almost nightly fast food, Will also misses watching movies and hopes to see one on a zero day in Auckland. Will is easy going about things and it’s been easy to work together and compromise with both he and Becky. I rely on Will’s reading skills to hopefully catch everything I’m bound to miss! It’s been pretty natural for the three of us to work together this past week. There are a ton of variables out here, especially on the North Island, so it can often be easier to do it solo. So far, we’ve all been able to easily agree on town stops, daily routines, and all the other zillion decisions that have to be made on this trail. 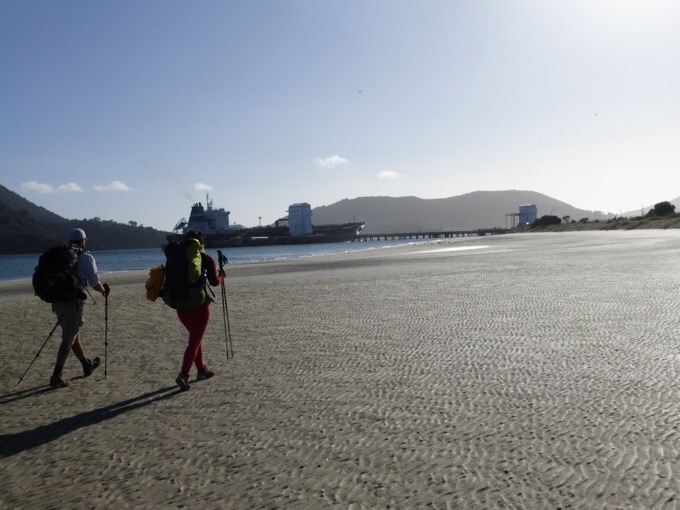 It’s also been great to have two other eyes and ears out there to literally and figuratively navigate the Te Araroa. Yep, all is good, and it’s been fun to team up with some like-minded people on such a variable trail. We are just about a week from Auckland, and that feels significant. Onward and southward! As a NZ couple planning to hike the T.A. next season,the detail in your blog has been invaluable. Also your recommendation of the guthook app is gold as well and your comments as well as other users on there will be a real help. We also are like minded in the walk every step (no hitching road sections) thru hike. The T.A. 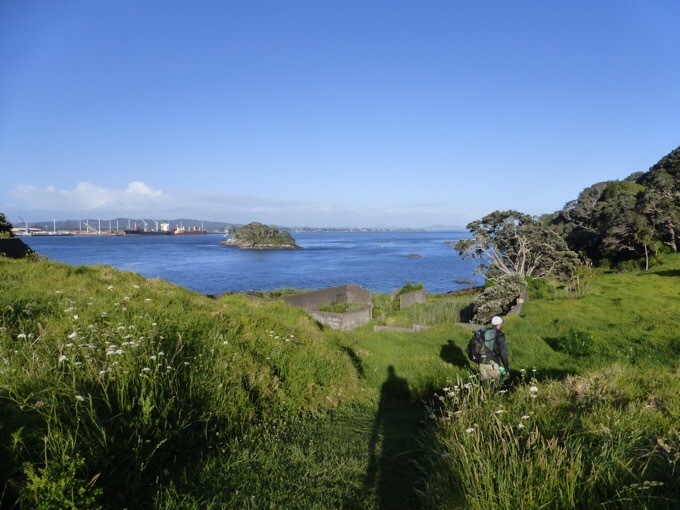 Is very unique, enjoy the coast,the beach walking,the mud,the all too many cafes because very soon that will all disappear and give way to new experiences.Enjoy the two day walk through Auckland city and take it for what it is……part of the trail and another experience.As you get closer to the Whanganui area of your hike I will give you some options and tips for the river section so you get the best out of it without having to do too much ringing around etc. We hope the weather settles down for you guy’s,keep the tips coming,we really apppreciate them…..thank you. Oh cool, thanks! Yeah, people say Guthook is pricey, but we absolutely love it and it’s worth every penny! Wow, you’re considering Tasmania too! Amazing after the walks you’ve just completed. I came to Tassie for a look 34 years ago and love it here that much that I never left. Good onya. I hope it works out! Would be a great finale. 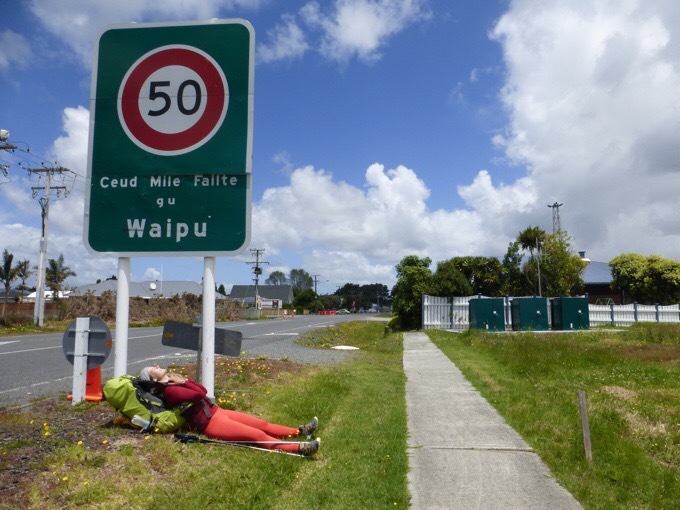 Hi Erin, I thought you might like to know that the “ceud mile failt”on the Waipu sign means “A hundred thousand welcomes” in Gaelic. It will be interesting to see if things change to a wilder trail experience once you are south of Auckland. Oh! I was wondering that! We just learned the Scottish history of this town as well! Neil – Thanks for the Gaelic translation. I suspected that’s what it was. Oh for your youth and enthusiasm ! Well -I have enthusiasm . The 3 of you are amazing -all that hard plodding along with big smiles ! Actually -this sounds like a tough trail and I admire everyone doing it . The town and social side of things are necessary incentives to keep you all going . As usual , great photos . Thanks again . 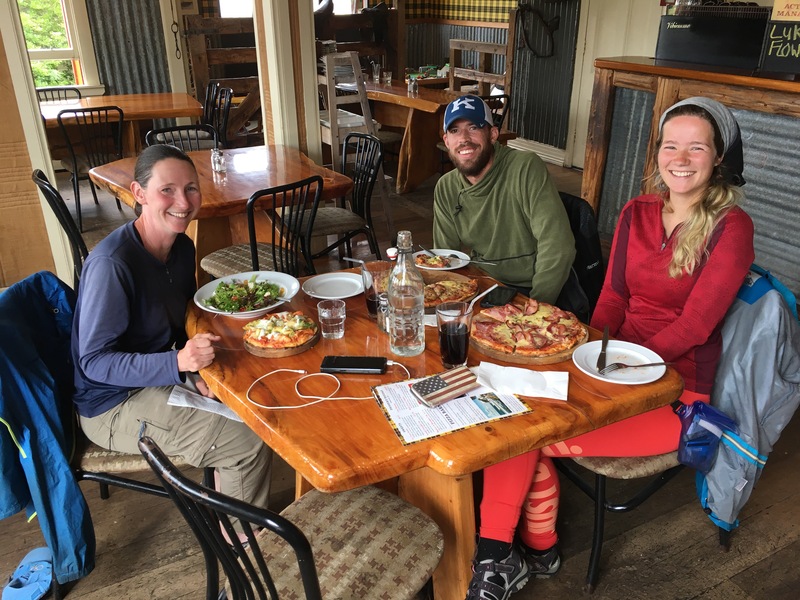 The picture of you three at the Pizza Barn is a real visual of how you work and relax together. It looks so enjoyable. Glad you three have been devinely connected.